In the middle of a peloton, racing cyclists experience only 5 to 10 percent of the air resistance they have when cycling alone. That is about 10 times less than was previously assumed. 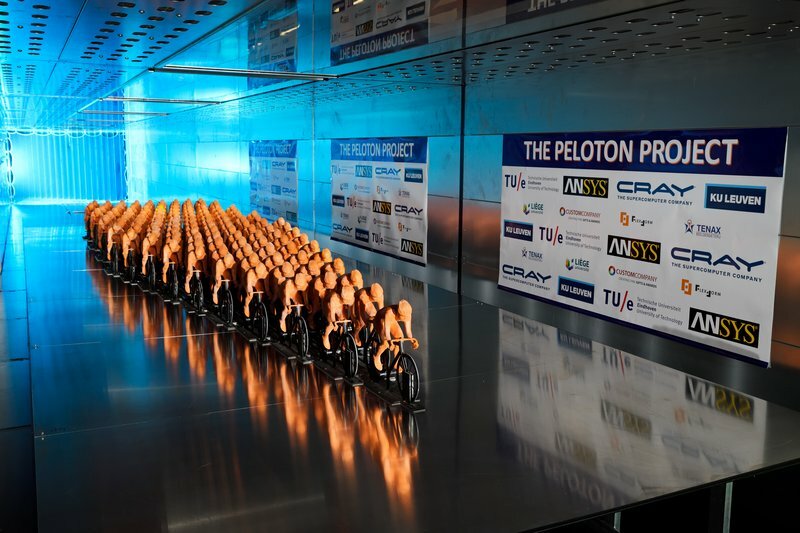 This is shown by calculations and wind tunnel research on a peloton of 121 cyclists by TU Eindhoven, KU Leuven, software company ANSYS and CRAY supercomputers. The results may explain why so few escapes in road cycle races are successful: the assumptions contained in the calculation models that race teams use to determine their strategy are incorrect. It is well known that in the middle of a cycling peloton you ride 'out of the wind' and therefore experience less air resistance. But how much less has never been well researched. From previous research with small groups of riders, estimates have been made of 50 to 70 percent of the air resistance that you experience as an individual rider. But professional riders suggest that in a peloton you 'sometimes hardly have to pedal', so the air resistance must be much lower. The study is a combination of computer simulations and wind tunnel measurements (including a complete peloton of 121 models), which independently gave the same results. The researchers examined two pelotons of 121 riders, where the distance between the rows differed slightly. Computer simulations amounted to 3 billion cells - a world record for a sports application - and required CRAY's American supercomputers and tens of thousands of software licenses from the company ANSYS. They still had to run for 54 hours on end for the calculation of a peloton, with a total of 49 terabytes of working memory. Other partners involved in parts of this project in addition to the four core partners mentioned above are the University of Liège and the companies Custom Company, FlexForm and Tenax Image Foundry.